Pipes for underground fuel transport for TransCanada Corps. Keystone XL pipeline lie in a field in Gascoyne, North Dakota on April 23, 2013. 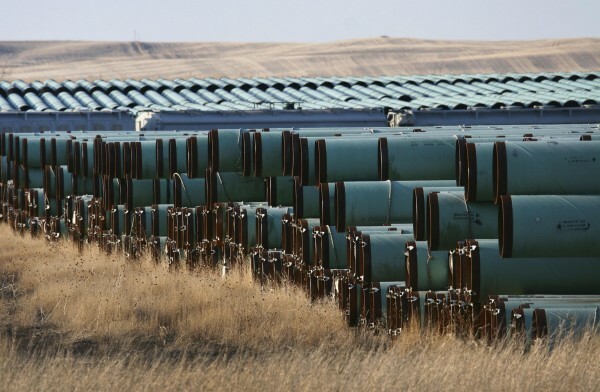 Congress has rejected the Keystone XL Pipeline by one vote. But does it matter? Sen. Angus King, depending on how you look at it, cast the deciding vote in the Senate to reject the nearly 1,200-mile long oil pipeline. His “no” vote doesn’t kill the project, but it puts it back in the regulatory arena, where it belongs. “Congress is not — nor should it be — in the business of legislating the approval or disapproval of a construction project,” King said in a press release before Tuesday’s Senate vote. He’s right, but it is understandable that backers of the pipeline are frustrated with the slow pace of the review process. Worse is President Barack Obama’s foot dragging. Much of the regulatory review is complete and has found no significant adverse impacts from the proposed pipeline, which would run from Alberta, Canada, to Nebraska, where it would connect with existing lines to carry the oil to the Gulf of Mexico. Ultimately, the decision rests with Obama since the project requires a presidential permit. He has stalled on a decision as he tries simultaneously to appease his environmentalist supporters and appear welcoming of new energy development. If the legislation voted on this week had instead set a deadline by which the president needed to make a decision on the pipeline, King said he would have supported that. Sen. Susan Collins voted for the measure that would have pushed the project along. Six years ago, TransCanada filed an application for the pipeline permit with the U.S. State Department, the relevant agency because the line would cross the U.S.-Canada border. Because of the broad scope of the project, the State Department consulted with other agencies, including: the Environmental Protection Agency and the Energy, Commerce, Interior, Energy, Defense, Justice, Homeland Security and Transportation departments. According to a timeline put together by Reuters, in August 2011, the State Department issued a final environmental impact statement that determined the project would not have significant adverse environmental impacts. This determination was put out for a required 90-day comment period. Concerns were raised about the route through the Sandhills region of Nebraska. In November 2011, TransCanada and the Nebraska Department of Environmental Quality agreed to an alternative route. In December 2011, Congress attached a provision to a tax bill requiring approval of the pipeline within 60 days unless the president found its construction was not in the national interest. Obama declined to issue the permit in December 2012, saying the short timeline imposed by Congress did not allow enough time to review the new route through Nebraska. TransCanada submitted a new application in 2012; the governor of Nebraska, Dave Heineman, approved the new route through his state in January 2013. Two months later, the State Department issued its review of the new route, concluding it would have minimal environmental impacts and would not increase greenhouse gas emissions. But the path to approval in Nebraska encountered a bump in February 2014, when a Nebraska court ruled the governor’s approval was unconstitutional. An appeal is pending before the state’s supreme court. Predictably, Obama has used this uncertainty to further delay a decision on the pipeline, which set up this week’s vote in Congress. Although there are already millions of miles of pipelines crisscrossing the United States, Keystone XL has been a particular target of environmental groups because it would carry oil derived from tar sands, which require more energy to extract than conventional oil and gas. The process also produces more carbon emissions. Oil and natural gas are America’s top energy sources, with coal a declining third. That is not going to change anytime soon; renewables, such as hydro, wind and solar are a tiny fraction of the country’s energy mix and remain controversial. This means we must find the safest ways to extract and transport oil and gas. To be sure, there are risks to all methods of transporting oil. But, available evidence points to pipelines as the safest way to move oil and gas over long inland distances. Transporting oil by pipeline also is less expensive. Transport by rail costs three times what it costs to send oil through a pipeline, according to oilprice.com. Now that that effort has failed, it is time for the review agencies to complete their review and for Obama to make a decision.